Does your stomach start to do backflips when it’s time to visit the dentist? Does even just the idea of walking into a dental office cause you to panic? If so, you are like millions of Americans who feel anxious about visiting the dentist, and you should know that sedation dentistry in East Islip can provide a solution to help you get the dentistry you need in a safe and comfortable manner and on a consistent and regular basis. Nitrous oxide is an effective sedative agent that becomes a colorless, odorless gas when it’s mixed with oxygen. Often called laughing gas because of the euphoric feelings it produces for some patients, your dentist will administer nitrous through a small, comfortable mask that you wear throughout your dental procedure. What Are the Benefits of Using Nitrous Oxide for Dental Procedures? One of the greatest benefits that laughing gas offers is the quick way it takes effect. It works right away to help patients feel happy, calm, and at ease. Better yet, it also leaves your system immediately as soon as the mask is removed, which means that it’s safe for patients to drive and resume normal activities. 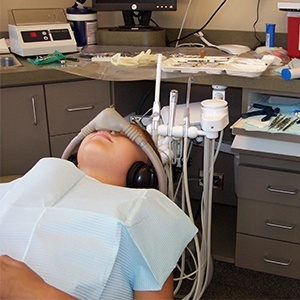 Nitrous oxide is also safe for children to use, and in fact, it is a preferred way to help children who are anxious receive the dental care they need. Your dentist in East Islip is happy to discuss using laughing gas for your son or daughter’s dental procedures if you feel it will help put them at ease. Nitrous can be utilized during most any type of dental procedure including preventive cleaning and checkups. This makes it an ideal sedation option for patients who feel mild to moderate anxiety about visiting the dentist. How can I Learn More About Nitrous Oxide? Patient comfort is a primary goal at our office and we go above and beyond to ensure that our patients have an excellent experience each time they visit our East Islip dental office. So, if you feel that nitrous oxide might benefit you or a loved one, your team at East Islip Dental Care is happy to discuss using it with you prior to completing any procedures. If you’d like more information about nitrous oxide, or if it’s time to schedule your next appointment, contact East Islip Dental Care today.